With this equipped, a player may attack as much as desired during their turn. If you have this weapon in your hand and another weapon equipped, you can attack using the current weapon, then switch to the Crossbow and attack more. If you have no weapon equipped and have multiple Attacks, you can attack without the weapon, then equip the Crossbow and use additional Attacks. Cao Pi is able to profit from killing other characters. When he has the Crossbow, he can gun someone down, then take all the Attacks in their hand. If he kills a rebel he even gets more on top of that. This gives him more ammo to push across the table and start on the next target. Zhang Fei has no need of this weapon since "Roar" provides an identical benefit. Even more, any other weapon provides additional benefits. This weapon is capable of dealing the most damage in one turn of any of the others. The price though is that it can run the user clear out of Attacks, leaving them vulnerable outside their turn. Since it is also a very desirable weapon, you should put it on with caution. Other players are very keen to take it from you, destroy it, or just cripple you before you strike. With that, this weapon often is the game ender, where someone gets it at the right time and mops up the competition. The repeating crossbow was a staple of ancient Chinese warfare. Although it was from far before the Three Kingdoms Era, Zhuge Liang is credited with improving the design. 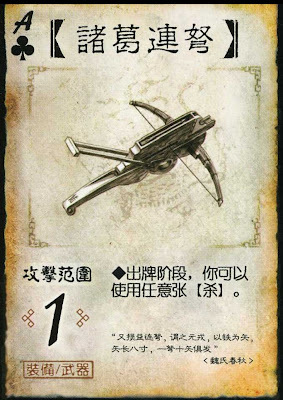 The crossbow is then given his name: Zhuge Crossbow or Chu-Ko-Nu. It was used in the same format in reality as in the game: to rain a massive barrage upon the enemy. In real life, it could shoot up to 10 bolts without reloading, and with massed numbers of soldiers, was very deadly. Compared to western crossbows, it could shoot much more quickly, but had less power and range. Since the bolts had less penetrative power, they were often dipped in poison. This way, even a superficial wound would be fatal.